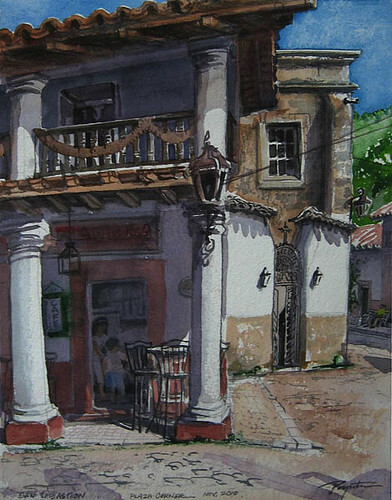 NEW ” San Sebastion – plaza corner #1″, originally uploaded by Jan Poynter – ARTIST. I am currently planning painting classes and a workshop in Bucerius, Mexico for the spring of 2013. For local residents (english speaking) Snowbirds and travellers welcome. If you will be in the Puerto Vallarta area Feb-Mar 2013 – consider joining us. I will be in Bucerius in Nov-Dec 2012 doing a fundraising art project for the Bucerius Billingual Community Center and will fine tune the details based on the interest at that time. and I will include you on the email broadcast list. This workshop will include a tour up to rustic San Sebastion del Oeste – Jalisco. Hi there – sorry I won’t be in Mexico at that time. We are travelling on an extended road trip at present through the Southwest. and I may be hosting a workshop (2 day – approx $240) or offering private lessons ($50 hr – 2 hr minimum) while I am there for a month or so. I also paint “plein air” on location – and will post paint out meeting locations for others to join me. lots to see in a close area of the central town – and good food along the way. I send out upcoming course info and offer some free online tips and techniques.